KLOS Presents High & Mighty Festival has announced a new and larger venue providing a full festival experience, with an expanded area for carnival rides and additional vendors, more attractions and vendors, plus the addition of a craft beer tasting event, offering unlimited samples of more than 100 beers, including many of Southern California's top breweries. KLOS Presents High & Mighty Festival will take place Saturday, August 5 and Sunday, August 6 at Village Green Park in Garden Grove, CA. The music lineup features headliners Sublime With Rome and Dirty Heads, along with SOJA, Jurassic 5, Stick Figure, Tribal Seeds, Tech N9ne, Magic!, Chief Keef, Custom, King Lil G, Murs, Ballyhoo!, Katastro, Pacific Dub, Iya Terra, Landon McNamara, and Know-Madik. The brainchild of Sublime With Rome and Dirty Heads, the two-day event is produced by premier music festival production company Synergy Global Entertainment (SGE), Mike "Cheez" Brown, Bill Hardie, and respected Orange County craft beer festival producer Brew Ha Ha Productions. 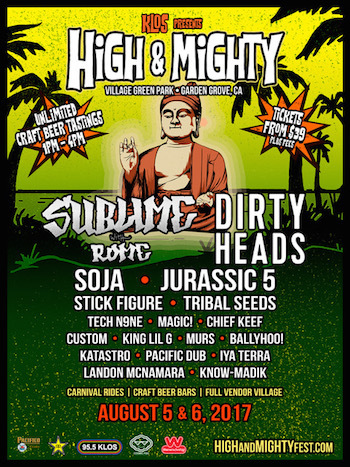 KLOS Presents High & Mighty Festival will feature two stages of music performances from top reggae, roots, hip-hop, and rock artists, plus unlimited craft beer tasting (1:00 — 4:00 PM) lifestyle vendors, carnival rides and games. Steve Jones, Mayor of Garden Grove commented, "I'm beside myself to think my favorite all-time band (Sublime With Rome) is going to play right here at Village Green Park! This festival will put Garden Grove on the map and go a long way towards helping us reimagine the city as a more vibrant and desirable place to live, work, and play within Orange County." During VIP and early entry tastings (from Noon — 4:00 PM), and general admission tastings (from 1:00 PM — 4:00 PM) daily, 21+ attendees at KLOS Presents High & Mighty Festival will enjoy unlimited craft beer samples from top breweries. Local food trucks and pop-up restaurants will also be on site selling a variety of delicious and unique food options throughout the day and evening. After 4:00 PM, alcohol will be available for purchase at concession stands. Music starts at 1:00 PM and the festival ends at 10:00 PM on Saturday and 9:00 PM on Sunday. Cameron Collins, Co-Founder & Director of Events at Brew Ha Ha Productions says, "If you're going to do something… do it right! This event could not be more right for the community and breweries! Everyone is excited to be part of such a great event that showcases so much of Southern California summertime culture. Attendees will enjoy dank and refreshing beers from top breweries like Artifex Brewing — San Clemente, Chapman Crafted — Orange, Bottle Logic Brewing — Anaheim, Lost Winds — San Clemente, Mad River — Humboldt, Noble Ale Works — Anaheim, Three Weavers — Inglewood, Knee Deep Brewing — Auburn, and many more!" Single-day tickets start at $39 and weekend tickets start at $69. Note: Ticket prices listed do not include parking and fees. VIP Lounge packages are $149 per day. This includes 1 VIP admission ticket to the selected day of the festival; a designated VIP entry lane into the venue; a commemorative laminate; and access to the VIP Lounge, which will feature a VIP cash bar, access to a VIP viewing area of the main stage, VIP restrooms, and comfortable areas to sit and relax. Enjoy High & Mighty Festival an hour early with first tastes from all of the craft beer on tap! Entry time for early entry festival admission purchasers is Noon. Meet & Greet — Sublime With Rome packages are $299. This includes 1 VIP admission to the Saturday date of the festival; a designated VIP entry lane into the venue; a commemorative laminate; access to an intimate Meet & Greet with Sublime With Rome (at a designated time) and photo op; a limited edition High & Mighty poster; and access to the VIP Lounge, which will feature a VIP cash bar, access to a VIP viewing area of the main stage, VIP restrooms, and comfortable areas to sit and relax. Enjoy High & Mighty Festival an hour early with first tastes from all of the craft beer on tap! Entry time for early entry festival admission purchasers is Noon. Meet & Greet — Dirty Heads packages are $299. This includes 1 VIP admission ticket to the Sunday date of the festival; a designated VIP entry lane into the venue; a commemorative laminate; access to an intimate Meet & Greet with Dirty Heads (at a designated time) and photo op; a limited edition High & Mighty poster; and access to the VIP Lounge, which will feature a VIP cash bar, access to a VIP viewing area of the main stage, VIP restrooms, and comfortable areas to sit and relax. Enjoy High & Mighty Festival an hour early with first tastes from all of the craft beer on tap! Entry time for early entry festival admission purchasers is Noon. Visit www.HighandMightyFest.com for details and to purchase tickets.